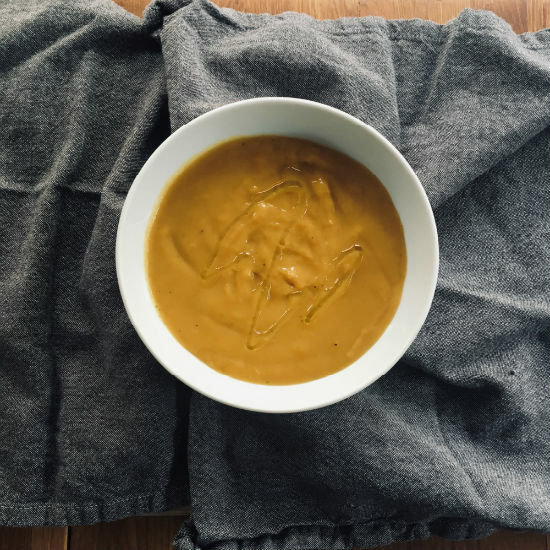 It’s squash season and a great time to take advantage of making soup! This soup is one of the easiest soups you’ll ever make which is why I wanted to share it with you. It even has Omega-3 fats! So you can see that eating butternut squash (or any orange and yellow winter squash in general) is a great option to stay healthy all winter long. In a large dutch oven or pot, heat the ghee and oil over medium heat and add the leeks. Sauté for about 5 minutes until a bit golden. Add the curry powder and cook it with the leeks for another minute. This process helps to bring out the flavours in the curry powder. Add the butternut squash and cook for another 2 minutes, mixing it in with the leeks and curry powder. Add just enough chicken bone broth to cover the vegetables by half an inch or so. This is a pureed soup so you don’t want it too watery. Bring to a boil. Turn down the heat, add the salt, cover and let it simmer until the squash is fork-tender–about 20 minutes. When the soup is ready, use an immersion blender or regular blender to puree the soup. Return to the pot to heat a bit more. Serve topped with a glug of olive oil. Easy peasy! Let me know if you make this! My kids loved it and asked for seconds which is rare in the household.